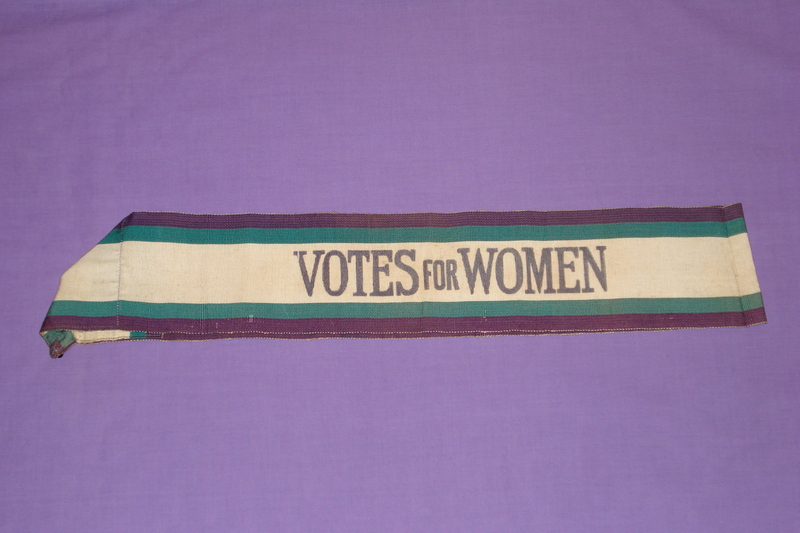 To celebrate the release on 12 October of the film ‘Suffragette’ (for which I was an historical consultant) I will post each day an image of a suffrage item – or, in the case of today, items – that have passed through my hands. 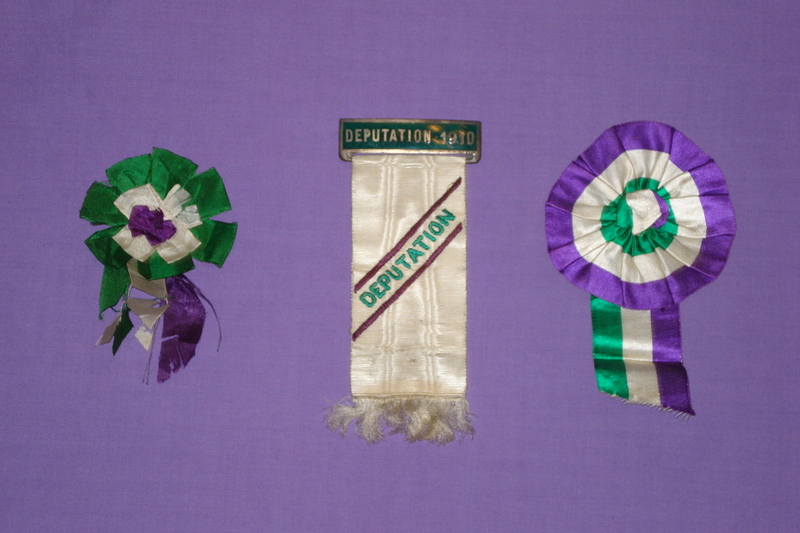 Today’s images: The Morrison Suffrage Collection. By the mid-1870s Evelyn Murray was married to a Robert Morrison. They had a daughter, also named Evelyn Morrison, born c 1881. At some point Robert Morrison died and it was as a widow that Mrs Morrison, with her daughter, Evelyn, arrived in Britain sometime between 1891 and 1901. Mrs Morrison ‘worked’ for the Liberal Party before becoming involved with the WSPU. 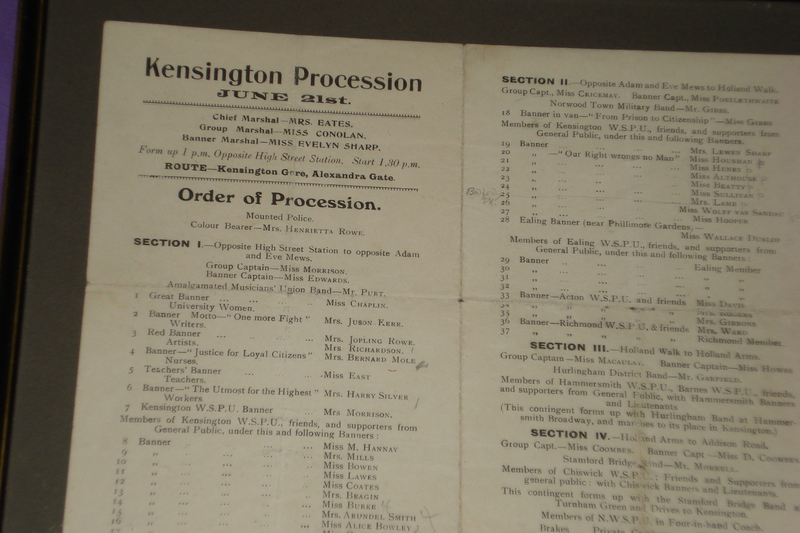 The younger Evelyn was a WSPU speaker and in February 1910 was elected joint honorary secretary of the Kensington WSPU. Miss Evelyn Morrison was a ‘Group Captain’ in charge of Section One of the WSPU’s spectacular procession to Hyde Park on 21 June 1908. 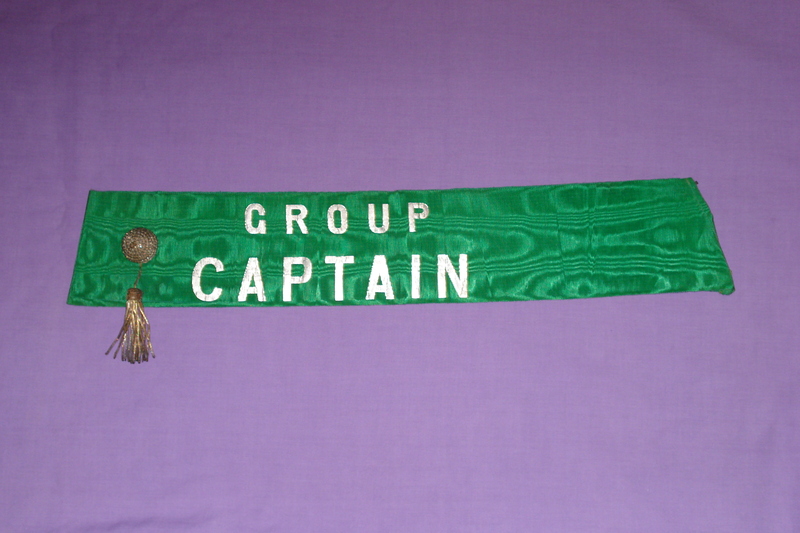 It would be for this that she made the ‘Group Captain’ sash. I am pretty sure that the ‘Votes for Women’ sash also belonged to her. 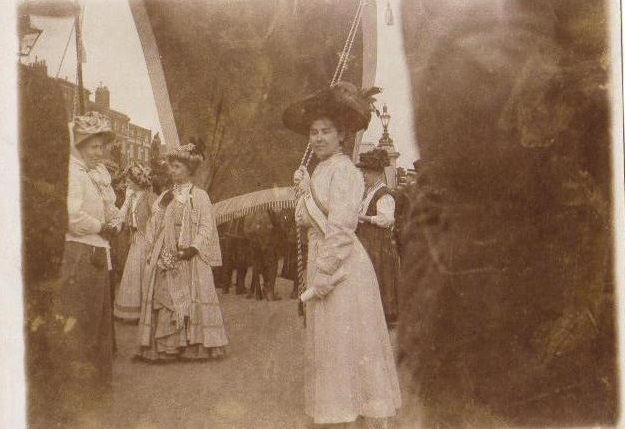 Here is Miss Evelyn Morrison wearing just such a sash – in a procession alongside Mrs Pankhurst. 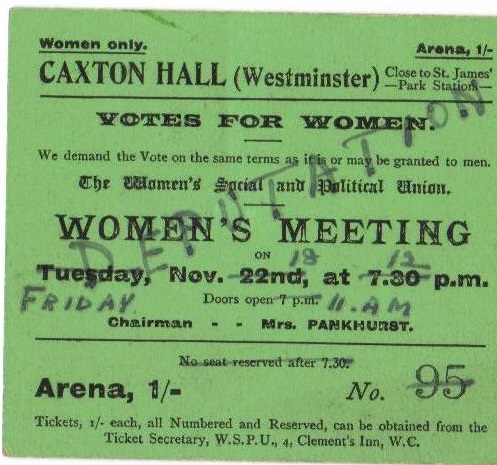 This is the ticket issued to Mrs Morrison for a 22 November 1910 WSPU meeting in Caxton Hall. However, as we can see from the hand alterations to the ticket, the date was brought forward. The collection included two telegrams to Mrs Morrison, dated 15 Nov 1910, rescheduling the date of deputation to Parliament in which she was to take part. Mrs Morrison was arrested and the collection included the order issued by the Metropolitan Police, ordering her the appear the next day at Bow Street Police Court. The charge was one of ‘wilfully obstructing Police whilst in the due execution of their duty’. The charge against her, as against all the other women arrested on Black Friday was dropped and Mrs Morrison was discharged. Another telegram was included in the collection, sent from Mrs Morrison to her daughter from Southampton Street close to Bow Street court, dated 19 November, to say that she and all the others arrested with her the previous day had been discharged. The Home Office had decided it was not politic to charge so many women – 220 had been arrested on ‘Black Friday’. On 4 July 1912, in the genteel setting of Church Street, Kensington, Mrs Morrison was issued with a gun licence. Why should she require to carry a pistol? At this time WSPU militancy was reaching fever pitch – with Mrs Pankhurst being regularly arrested and then released after hunger striking. It is interesting that this particular piece of paper has survived alongside the other, solely suffrage, material. The inference is that the issuing of the licence was not unconnected with Mrs Morrison’s involvement in the suffrage movement. Cyclostyled letter from Christabel Pankhurst – probably to Mrs Morrison – it dates from November 1910 and refers to meetings being held at the beginning of the week after the deputation in which she took part. 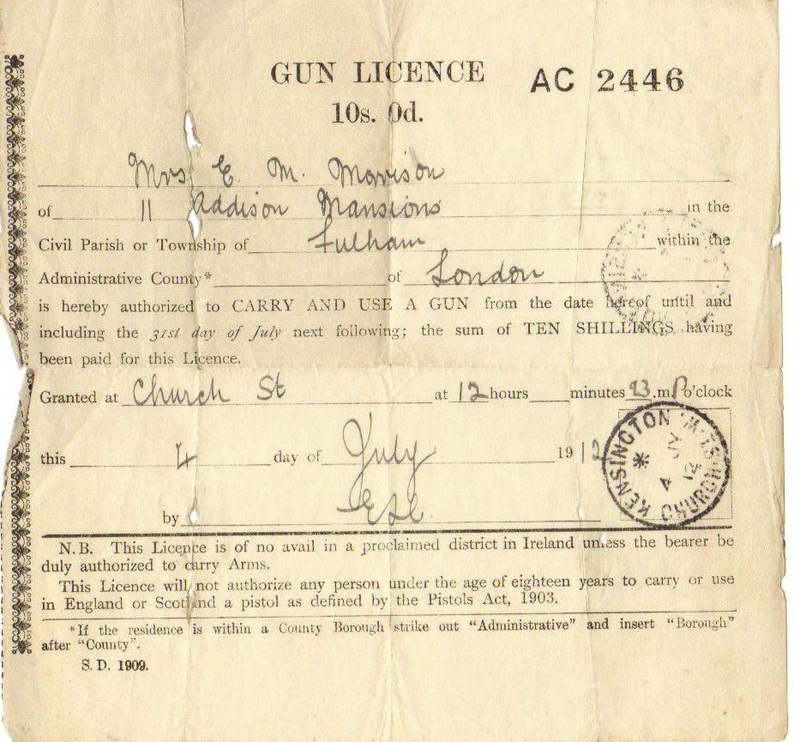 Gun Licence issued to Mrs Morrison on 4 July 1912. This was at a time when WSPU militancy was reaching fever pitch – with Mrs Pankhurst being regularly arrested and then released after hunger striking. It is interesting that this particular piece of paper has survived alongside the suffrage material. The inference is that the issuing of the licence was not unconnected with Mrs Morrison’s involvement in the suffrage movement. Two telegrams to Mrs Morrison, dated 15 Nov 1910, rescheduling date of deputation to Parliament in which she was to take part. This was to become notorious as ‘Black Friday’ when there was a near riot in Parliament Square and many women were assaulted by the police. The third telegram (the one in the centre) is from Mrs Morrison to her daughter, sent from Southampton St close to Bow Street court, dated 19 November, to say that she and all the others arrested with her the previous day had been discharged. (The Home Office had decided it was not politic to charge so many women – 220 had been arrested on ‘Black Friday’. The order issued by the Metropolitan Police when Mrs Morrison was arrested in the course of ‘Black Friday’, ordering her the appear the next day at Bow Street Police Court. The charge was one of ‘wilfully obstructing Police whilst in the due execution of their duty’. As we have seen the charge was dropped and Mrs Morrison was discharged. NB Inspector Crocker, who signed the charge sheet, was involved for many years in pursuing suffragettes. This entry was posted on September 10, 2015, 10:48 am and is filed under Collecting Suffrage, Suffrage Stories. You can follow any responses to this entry through RSS 2.0. You can leave a response, or trackback from your own site. Doesn’t Evelyn Morrison, in her gorgeous clothes and ceremonial sash, look super? She must have been very proud indeed to be marching alongside Mrs Pankhurst. But then (almost all) Australian women already had the vote in 1908, so they could afford to be an inspiration to the British women who were a longggg way from achieving universal suffrage.